Logan has been a leader in manufacturing and assembling specialty equipment for over 40 years. Our two large assembly areas are equipped with the latest in state-of-the-art heavy duty machinery as well as computerized tracking and inventory systems, overhead cranes and power hookups for voltages up to 440. Personnel in our mechanical, pneumatic, hydraulic and electrical departments are fully qualified to handle even the most demanding project. With these abundant staff and equipment resources, Logan Machine can offer an unbeatable combination of quality service and quick turnaround at competitive prices. Logan has manufactured and assembled equipment for a wide variety of industries since 1958, including hundreds of major pieces for the rubber and steel industries. In our 35,000 square foot assembly area we provide it all, including painting, packaging and crating. For maximum efficiency, all materials are tracked by computer to ensure that there are no delays during final assembly. At Logan, we have the tools and people to finish your project right and on time. With 35 years of experience in machine wiring and cabinet building, our staff electricians are totally familiar with all types of equipment, whether it's for domestic or foreign use. At Logan, all electrical work is performed in-house by highly skilled technicians who can take a project from concept to completion or modify existing incomplete wiring runs, boxes or layouts. 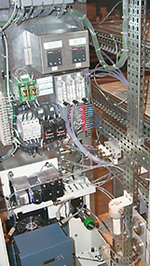 To ensure that our customers receive only the finest in quality and service, Logan Machine follows NFPA-79 standard practices in all of our wiring projects.